Although it is only the beginning of November, it seems that Christmas is well and truly upon us. I know this sounds crazy as it was only a few of weeks ago that we were enjoying 21-degree sunshine in London, but it seems that over the past few days things have quickly taken a very festive turn. Maybe the clocks going back was the catalyst, or perhaps the sudden change in weather- but what is clear is that our high-street retailers are going full steam ahead and spreading the Christmas cheer- the Starbucks red cups are out, the Christmas sandwiches are quickly making their way onto the shelves, and the John Lewis Christmas ad has landed. The retail giant released the ad last Thursday, and it is everything you would expect a John Lewis advert to be- heartwarming, moving, and an all round-tear jerker. But this got me thinking, what was the first JL Christmas ad? And have they always been this sweet and lovely? I was surprised to see that the first Christmas ad from JL hit our screens in 2007. ‘Shadows’ sees a group of people running in and out of shot stacking presents; with the different shadows depicting whom these presents are the perfect gifts for. Although this is nice and jolly, it’s nothing like the iconic ads that we all know and love today. 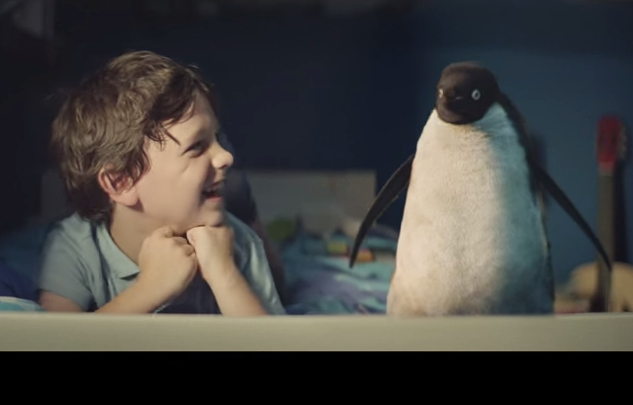 So when did John Lewis become so famous for its Christmas ads? The adverts in 2008, 2009 and 2010 were along similar lines of Shadows- ‘From Me to You’, ‘Sweet Child of Mine’ and ‘A Tribute to Givers’ were all based around finding the perfect gifts for your loved ones- and although they are full of sentiment, it’s not quite at the level we’ve seen over the past few years. These ads all ended with a message to the audience, with phrases like ‘If you know the person, you’ll find the present’ and ‘For those that care about showing that they care’ appearing on screen at the end of the ad. It was in 2011 that John Lewis upped its game and really became famous for its Christmas ads. ‘The Long Wait’ sees a young boy impatiently waiting for Christmas so that he can give his parents their gift. We see the boy growing more and more frustrated that Christmas just isn’t here yet, with scenes of him staring out of the window in his nativity costume, trying to magic time away as a wizard, and endlessly rocking to and fro on his swing in the garden. This was a truly heart-rending ad that really put the John Lewis ad on the map. Although the cover songs featured in the ads started in 2008, this particular advert was the real turning point for the retailer. There was no need for it to tell us the take-away message at the end of this ad- because instead, we all felt it. And since then, the JL ads haven’t failed to disappoint- we all remember ‘The Journey’ of the snowman and his snow-wife in 2012, and last year’s ad, ‘The Bear and the Hare’, about the bear who had never seen Christmas. And this year? I won’t give too much away but in true JL fashion, ‘Monty the Penguin’ and his friend Sam win our hearts as they give the gift of love this season. As the Christmas ads become increasingly popular amongst the general public, we can see that John Lewis has really upped its PR and marketing activity to reflect this. 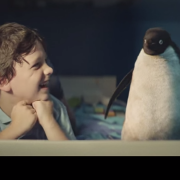 This year’s ad was released with the hash tag #MontyThePenguin to fuel the conversation on social media, and the retailer will also be using its in-store displays and YouTube channel to continue promoting the ad and getting people talking. Channel 4 has secured the rights to the TV debut, which aired last Friday during Gogglebox, and there has been a huge amount of coverage in national newspapers already just a few days after release (thanks to embargoed press releases sent weeks in advance and secret first-looks at the video in the JL offices). As a £7million campaign, I am sure we are going to be seeing much more of Sam, Monty and Mable over festive season. So get the Christmas jumpers out, the Turkey sandwiches in hand, and embrace the new JL stars, because Christmas is well and truly here! Well done John Lewis.